When Paul and I got engaged, I got really strict about my work schedule. Paul was the one who really encouraged me to start COF with my best friend, Kristin. He was a huge reason I stuck through blogging and I owe so much of my job to his help. However, I didn’t want our marriage to be “work” all the time. He is a CPA but he isn’t in tax. He is an auditor, so he works 90 hour weeks from end of December to around May and I didn’t want the only time we had to be working. I buckled down, set out specific shoot days and rarely stray from it. Except when rain gets involved. Rain is such a diva, always affecting plans. It rained 7 days straight last week so I knew we’d have to shoot the weekend. I shot with my photographer, but he came along. I honestly forgot how much fun it is to work with your spouse. And by fun I mean he zips up all my dresses, hands me my bag, tells me when I have lipstick on my teeth and keeps me laughing while people wonder, “Isn’t she a little old to be taking senior pics?” haha! It’s a contagious characteristic so the day went by so quickly! I wore this dress to church [well and 4 other places last week, but I don’t need to call myself out for that…] and it was so comfortable! I even told Paul, “Okay, this dress is seriously a keeper. I’ll wear this thing until I’m 72, through pregnancies and all! It’s a little pricier, but I knew it would be a great basic to have in my closet for years to come while keeping the shape. I’ve found that sometimes when I skimp on chambray it gets holes in it or feels so stiff. Plus, when it is 108 in August I need something cool and this fabric is so breathable! To wear it to dinner I threw on a statement necklace and this Alma crossbody from The Lady Bag. 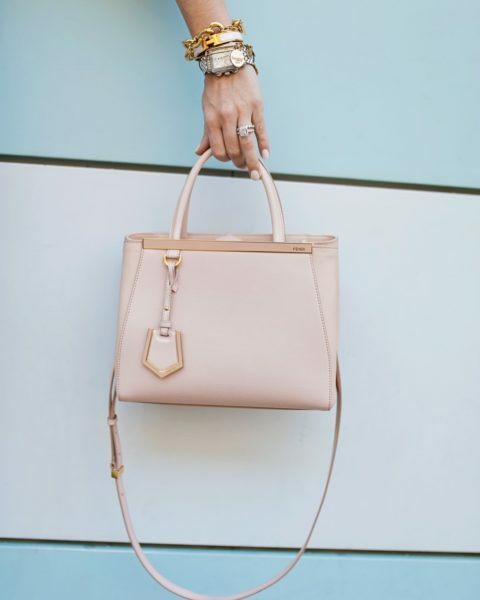 I love designer resale with handbags [makes it more affordable and less shopping guilt! 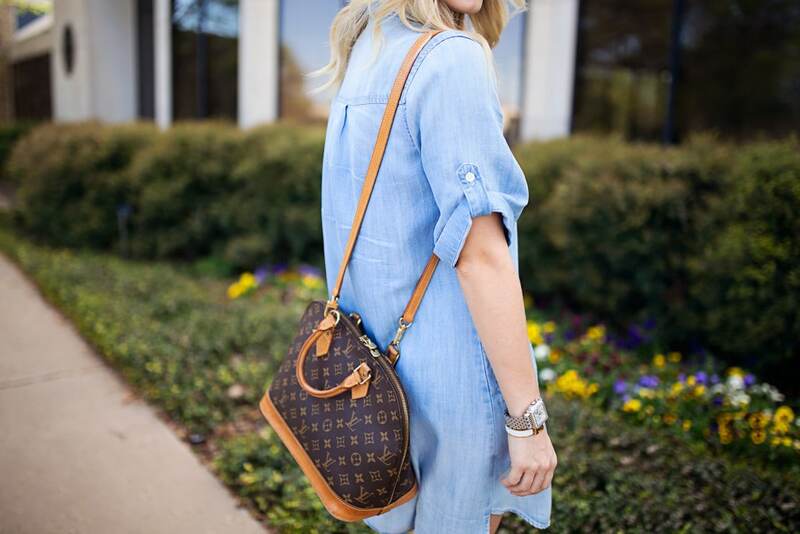 😉 ] and The Lady Bag specializes in Louis Vuitton. I thought this would be great for lots of trips we have coming up because it is a smaller bag that actually fits what you need without taking up your entire arm! So do you like working with your other half?! I’m so curious how other people like it if they are able to! Thanks so much for reading, have a blessed day! How lucky you are to have found Paul! 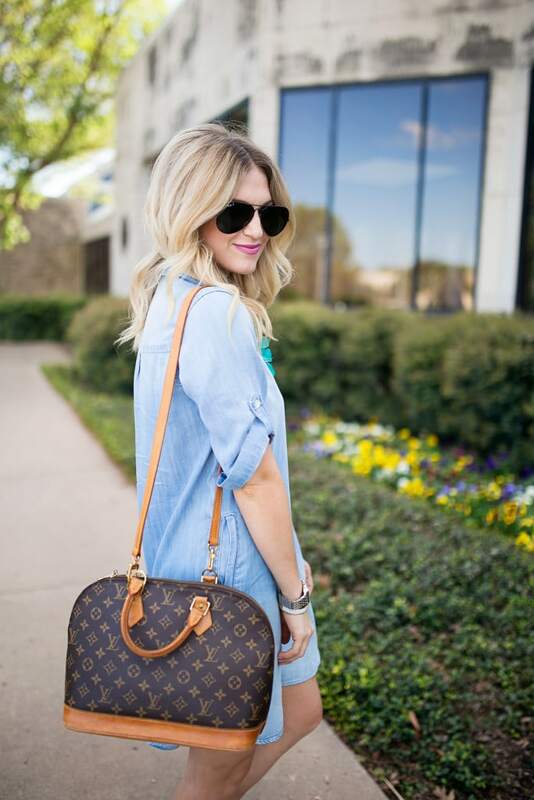 🙂 This look is too cute – I’m loving that chambray dress!! Y’all are the absolute cutest! Love hearing your sweet stories. My fiance takes my blog photos and we always have a really great time doing. He has me laughing nonstop! What a cute Spring outfit!! So sweet to hear about Paul helping with your blog and photoshoots. I am currently very much single but dream of finding a guy someday who enjoys helping with my blog! 😉 Haha!! This does seem like the perfect dress to have around when the temperatures start to spike! 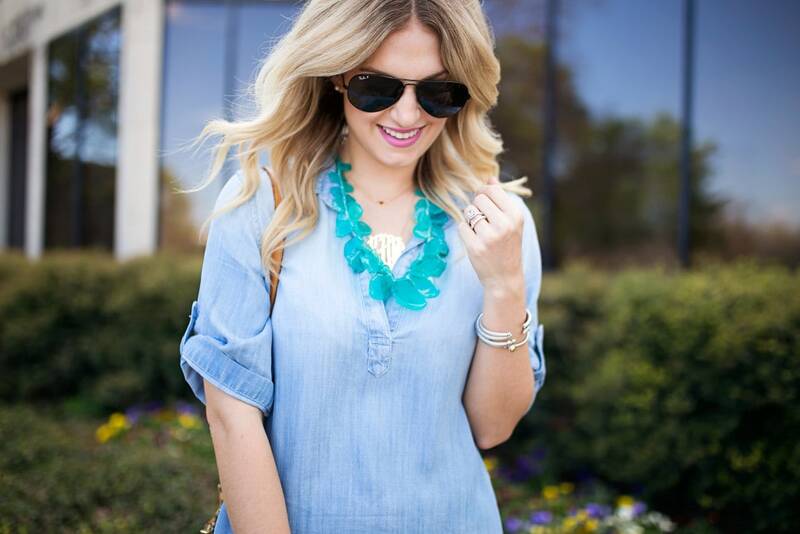 This is almost identical to my favorite spring outfit! Except this one may be even better because it’s so versatile! Hi Katey! 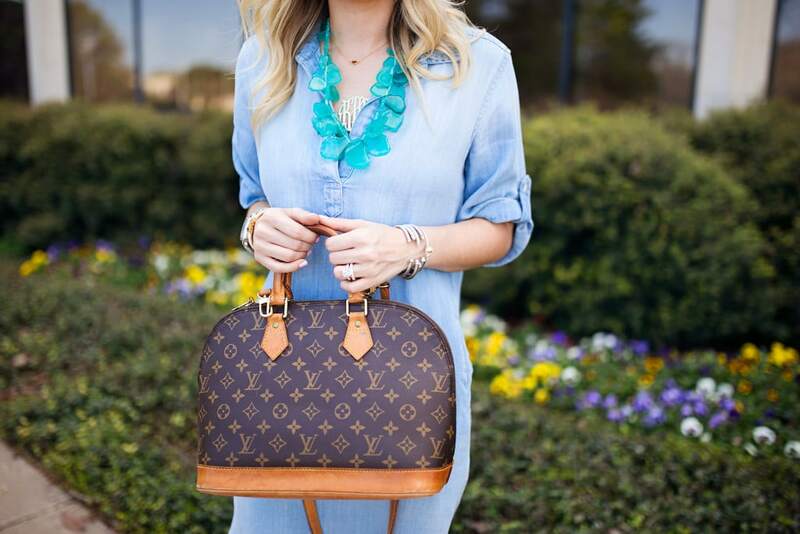 Have you ever thought of doing a post that covers some of your favorite places to get pre-owned designer bags?! I’m always worried about trying new sites because I’m worried the bags won’t be as nice as the pictures. Love love love your outfit!! At The Lady Bag we do not touch up our photos at all. We want to be honest with our customer about all aspects of the bag. We also guarantee authenticity! The Lady Bag prides themselves on customer service and I can assure you you will be thrilled with your purchase! If you have any doubts you can always send us a email and we can send more pictures. 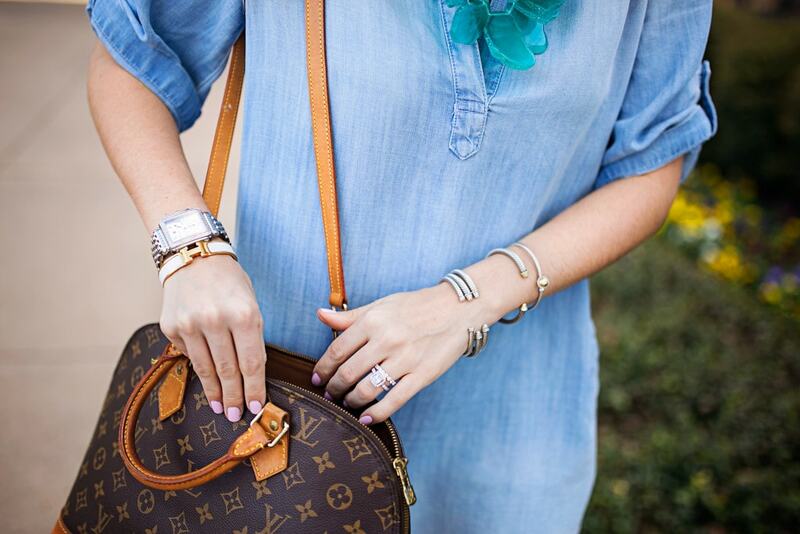 Don’t forget to use Katey45 for $45 off your Louis Vuitton! I bought these sandals & I love them so much!